Clearly, this is not a good time for NASA. Worsening geopolitical tensions with Russia have influenced spaceflight more than most other forms of inter-state activity. Never mind the smack talk from Moscow and the bickering between boffins on aerospace forums. The Russian crisis has the potential to become more serious for NASA than some analysts are willing to admit. It’s time to think of more than just deciding what to do if Russia withdraws from the International Space Station after 2020 or stops the flow of RD-180 rocket engines to the USA. There could be more consequences in the short term if the situation deteriorates even further. 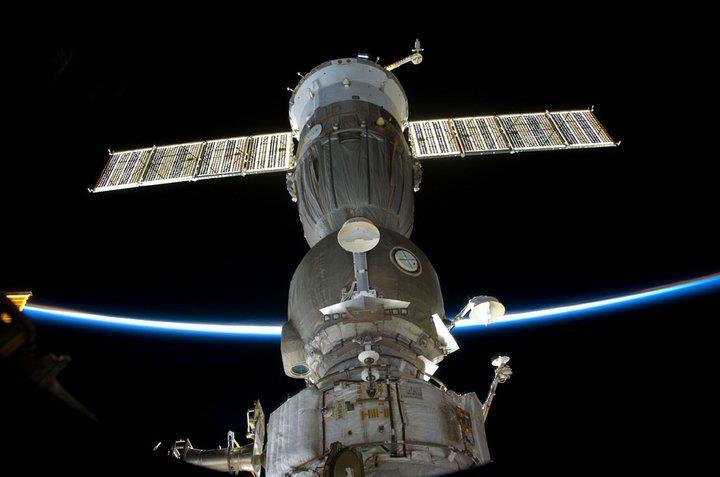 A Soyuz capsule docked at the International Space Station (Credits: Roscosmos). Official words from NASA have been fairly vague and somewhat peachy. They are so rose-colored that they provoke quiet if somewhat strained chuckling. Admittedly, this is to be expected. NASA is in a difficult position, needing to watch the potential wrath of governments in Washington as well as Moscow. There are also other international partners in the space station. Russia is not just holding America as potential hostages to its Soyuz space launches. It’s also doing so with every other nation hoping to launch astronauts there. The relative silence from the European Space Agency, national European space agencies, and those in Canada and Japan is fairly instructive. Nobody knows what to say. Nobody knows what to do. Nobody wants to make a bad situation even worse by speaking out. There’s an easy rebuttal to the worst-case scenario. Russia would be doing itself a tremendous injury by pulling out of the Station or disengaging itself too much from international spaceflight. This is true. However, it’s no guarantee against this happening. Students of international affairs are taught at an early stage that statecraft and inter-state activities are notoriously unpredictable. One reason for this is that states and groups do not always act logically or in ways that act to their own advantage. Another reason, often confused with the “illogical” category, is that states sometimes weigh the value of outcomes differently to other observers. Money, pride and harm can all be big or small matters, depending on who you are, what you have and what you are willing to sacrifice. There is also the matter of internal politics versus external affairs. Russia is a proud country, and is reasserting itself from a long period of regression. Spaceflight is one area where Russia has caused the world to watch in awe. Furthermore, America’s dysfunctional space program has rendered it weak to Russian intervention. Given the right calculus, further disruption to the Station and other areas of international co-operation in spaceflight makes perfect sense. Yes, they would lose money, lose credibility, lose missions and generally cause trouble for themselves. But the damage to the USA would be profound. Other nations would also be disrupted, but these nations are all much closer to the USA than to Russia, at least in political and strategic terms. Having snubbed its international partners, Russia would then be free to run its own independent space program. Russia has achieved autarky in spaceflight in ways that are essentially unmatched by any other nation at the present. It can launch cosmonauts aboard its own spacecraft. The Soyuz vehicle is highly reliable, as is the booster that launches it. Russia has plenty of experience in building space stations. Russia builds its own satellites. Russia has spaceports. An independent Russian space program is strategically and politically attractive in the current political climate. US and Russian flags fly at Russian Mission Control March 28, 2014 as astronauts from those nations prepared to dock their Soyuz to the International Space Station (Credits: NASA). We should not expect any hostage-taking in space. Any foreign astronauts launched on Soyuz will be returned safely aboard Soyuz. But at some point Russia could elect to suspend flights much sooner than current agreements could suggest. Progress cargo spacecraft launches could also be suspended. It’s unlikely that anything drastic will happen in the next three months, but who knows how policies will shift afterwards? We don’t even know how events will unfold in Ukraine, which is still in a state of flux after the annexation of Crimea. Further actions and counter-actions could escalate an already bad situation. A spill-over to spaceflight would be possible. NASA’s cheer squad will point to the ongoing development of commercial crew vehicles, the Orion spacecraft and the operation of two commercial cargo ships for the Space Station. We also have future launches by European and Japanese cargo vessels. This is all good. But it’s not enough to rescue NASA from a crisis in the very near-term. This period when NASA is weak in vehicle infrastructure is the most strategic window to launch a blow to NASA’s space program. Russia would certainly understand this. NASA needs some crisis planning right now. It’s almost certain that there’s a lot more talk happening behind closed doors than we know. But has anything practical come from it? Judging by the tones emanating from NASA’s public affairs officials, it seems that NASA is not yet ready to place a clear and dependable plan on the agenda. We have every right to ask if such a plan actually exists. Opinions expressed are those of the author and do not necessarily reflect the view of Space Safety Magazine or its sponsors.